A lone African-American man attends a Klan rally in Jackson, Mississippi, 1950. A lone African-American boy, left foreground, stands in a sparse crowd that turned out to hear Dr. Lycurgus Spinks, imperial emperor of one of the several Ku Klux Klan groups active in the South, speak to 56 members of his Invisible Empire, Jackson, Miss. Spinks told his group, “There aren’t any Negros within miles of here tonight.” This was the first public Klan rally at Jackson in 15 years. Police forbade them to burn the cross in the background. During the Great Depression of the 1930s the Klan’s membership dropped drastically, and the last remnants of the organization temporarily disbanded in 1944. For the next 20 years the Klan was quiescent, but it had a resurgence in some Southern states during the 1960s as civil-rights workers attempted to force Southern communities’ compliance with the Civil Rights Act of 1964. There were numerous instances of bombings, whippings, and shootings in Southern communities, carried out in secret but apparently the work of Klansmen. The Klan was unable to stem the growth of a new racial tolerance in the South in the years that followed. 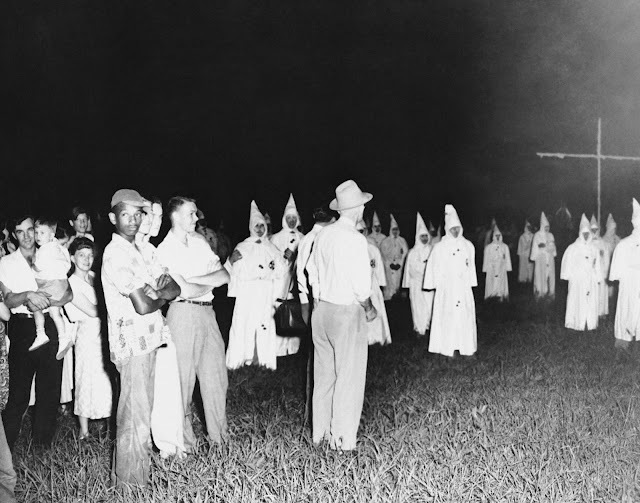 Though the organization continued some of its surreptitious activities into the early 21st century, cases of Klan violence became more isolated, and its membership had declined to a few thousand.